FREE In Office Teeth Whitening, with New Patient Exam & Cleaning. 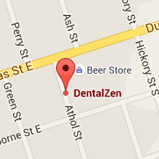 DentalZen wants to “thank you” for caring about your smile, with a Free Whitening for Life Program. Simply keep routine recall appointments and maintain your account in good standing (avoid past due balances) to qualify. Maintain your oral health by having routine hygiene appointments at least twice a year. New patients must have a complete exam, x-rays & cleaning. Existing patients need to have good oral health & no untreated tooth decay. Must be at least 18 years of age. Follow office policies for cancelling & rescheduling. You’ll receive a free in office whitening annually if the above criteria is met.